Thanks for the warm welcome, Michelle! Wow, I’m so excited to be here, guys. 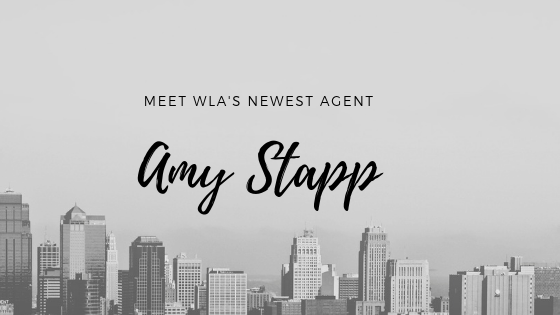 I’ve been a big fan of WLA’s talented authors for many years, and I’m thrilled to join the team. Let’s see… a little about me. I live in Manhattan with my husband, tiny son, and not-so-tiny golden doodle. My kid has the bluest eyes and my dog is a fluffy ball of joy, and, to my endless delight, strangers love to stop me on the street to tell me how cute they are. What’s that, you’ve written a book about dogs? Yes, we should talk. I’m originally from Indianapolis. If you’ve never been to the Midwest, that means I love corn and am polite to a fault. When I first moved to Manhattan, I said Hi to everyone I bumped into (to my then-boyfriend, now-husband’s baffled amusement). Don’t worry, I quickly outgrew that and am now an impatient and competitive sidewalk racer like any good New Yorker. But maybe because of my Hoosier roots, I have a strong sense of right and wrong, and I love stories that wrestle with faith and family ties, stories that champion the little guy, or that challenge me to consider something from a new perspective. I also have a longstanding fondness for the South that started sometime around 1992 when my mom and I watched Gone with the Windand Fried Green Tomatoeson repeat. I cemented that love when I went to college in Birmingham, grad school in Atlanta, and then was married in Charleston. For you Yankees, that means I’m a hopeless romantic, and I love sweet tea and stories about small towns and gossip. From an atmospheric Southern gothic to a lighthearted women’s fiction set in the Lowcountry, I’ve always been drawn to unique Southern voices. What else would you like to know? Well, I love to travel, preferably somewhere I can stick my toes in the sand. Favorite place I’ve ever been—Bali. And any book about Paris is an automatic buy. I love being outdoors—hiking, camping, running. I can build a fire like no one’s business. I’m the first member of my family in four generations who never worked in a factory. I ran a marathon one time. (One time was enough.) I love true crime and health/wellness podcasts. I can be a bit of a health nut. I have music on 24/7—country, Americana, Sinatra, Coltrane, everything. Oh! And I love books. I’m always in the middle of at least three books: usually a fun, playful romance or fast-paced YA; a more serious, dark thriller or the bookclub fiction everyone’s buzzing about; and a nonfiction about health, parenting, or spiritual growth. I have a deep appreciation for writers who spend years studying the craft. In my former life as an editor, championing my authors was by far the best part of my job, and I’m incredibly excited to devote the next stage of my career to helping authors achieve their long-term publishing goals. As a writer and long time devotee of Michelle and hier bibliolicious wolf pack, I am so very excited for you and your new adventure! All the best and wishing you many thrilling finds! The Wolf Pack IS the best! 🙂 Thanks so much for the warm welcome! Congratulations. Hope your new job is your dream job! Thanks for sharing about yourself. Sounds like we could make a great team. My query will be on its way very soon.